With the setting up of Kunjacko’s Udaya Studio in Alleppey and Subrahmanyam’s Maryland Studio at Nemom in Thiruvananthapuram, the practice of producing a movie in a year changed. 1950 saw the production of six films. Most of the films, however, took the safe route of making movies themed on the cruel stepmother, the plot of Balan, the first hit. Attempts were made to make Malayalam versions of successful Tamil films and produce films based on the puranas (ancient Hindu texts featuring stories of various gods). This period also saw a number of directors and technicians moving from Tamil to the Malayalam film industry. In 1951, the landmark movie Jeevithanouga was made. Jeevithanouga, which featured actor Thikkurussi Sukumaran Nair as the hero, was scripted by Muthukulam Raghavan Pillai, who wrote the story for Balan and directed by K. Vembu. The long and heavy dialogues and the intense, emotion-packed scenes struck a chord with the public and made it a super-hit of its time. It was also the first super-hit that provided a commercial platform for Malayalam cinema. In the 50s, a fresh breath of life revitalized Malayalam literature and this was reflected in Malayalam cinema as well. Many young and brilliant writers collaborated with film makers and others in the movie industry. Neelakuyil(1954) the first of a series of successful Malayalam movies with stories and characters with an inalienable connect to the land, was produced as a result of such a collaboration that was spearheaded by K. T. Pareekutty, the helmsman of Chandrathaara Productions. The movie, based on writer Uroob’s novel of the same name and jointly directed by Ramu Kaaryaat and P. Bhaskaran, was the first movie based on realism, in the history of Malayalam cinema. The film gave Malayalam cinema recognition at the national level, when it became the first film to be awarded the President’s Silver Medal. With this, the trend of making movies based on literary works saw a significant rise, as evidenced by the movies of this time such as Paadaattha Painkili (1957), Randidangazhi (1958), Mudiyanaaya Puthran (1961), Puthiya Aakaasam Puthiya Bhoomi (1963), Odayil Ninnu (1965) and so on. Parallel to this trend, there were also other kinds of movies being made like the Newspaper Boy which, at the time of its release in 1955, received no attention at all but was later pronounced and praised as Malayalam’s first realistic movie. At the beginning of the 50s, a group of young actors entered Malayalam filmdom, paving the way for a new era. It was during this decade that the evergreen heroes, Sathyan and Prem Naseer, arrived on the scene and went on to acquire a permanent and special place in the hearts of Keralites. By the end of the decade, there was a pantheon of talented actors in the field who played a crucial role in the growth of the industry. They included, apart from Sathyan and Naseer, the hugely popular heroines Sheela and Sharada, as well as actors like Ummer, P. J. Antony, Kottarakkara Sreedharan Nair, Adoor Bhasi and Bahadur. In 1961 Kandam Becha Kottu, the first Malayalam movie in colour, was released. This period also saw the rise of stars behind the scenes. Some of the luminaries who enriched the industry with their talents in areas like script writing, music composing, playback singing and so on included the Vayalar-Devarajan duo, Baburaj, K. Raghavan, M. T. Vasudevan Nair (Murappennu, 1965), K. J. Jesudas (Kaalppaadukal, 1961), O. N. V. Kurup (Kaalam Marunnu, 1955). Directors like P. Bhaskaran, Ramu Kaaryaat and A. Vincent could offer movies of high standards to an eager audience, while K. Sethumadhavan, Sasikumar, M. Krishnan Nair, P. Subrahmaniam and Kuchacko became the pillars of commercial cinema. 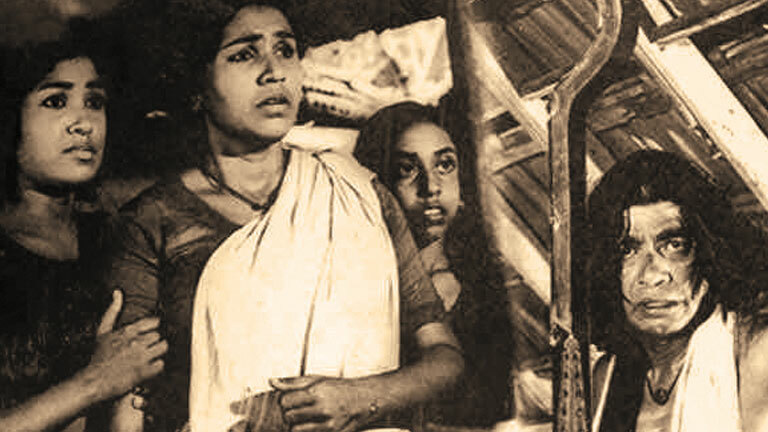 Chemmeen, the landmark film that took the whole of South India by storm, was released in 1965. The film, directed by Ramu Kaaryaat, became the first South Indian film to receive the President’s Gold Award and catapulted Malayalam cinema on to the international stage. For his labour of love, Kaaryattu spared no efforts and brought together the best minds and talents he could get. His team of superior technicians involved French choreographer Marcus Bartley, and the best technicians, singers and editors in the country. Soon after its successful release, Chemmeen became a phenomenon in the country. In 1969, the Government of Kerala instituted State awards for Malayalam films. Kumarasambhavam became the first movie to win the best film of the year. Vincent received the award for best direction for the movie Nadi, while Sathyan and Sheela won the awards for best actor (Kaalppaadukal) and actress (Kallichellamma) respectively.